April 2, 2015 -- A new survey by Vigilant Biosciences has found that most U.S. consumers know little or nothing about oral cancer. This offers a clear opportunity for dentists to educate their patients on the disease, the company noted. Vigilant polled more than 1,000 consumers ages 35 to 75 on their knowledge of oral cancer and oral cancer screening from March 16-23, 2015. More than two-thirds (68%) said they knew little or nothing at all about the disease. Additionally, only about one-third (37%) of respondents reported being screened for oral cancer at their last dental visit, but about 81% of them wanted to be screened for oral cancer at every dental checkup. 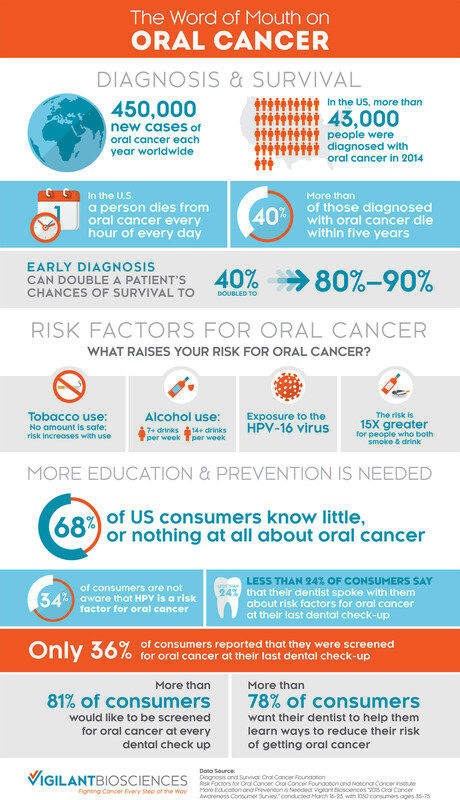 Oral cancer infographic. Image courtesy of Vigilant Biosciences. "This survey's findings demonstrate the need for greater awareness and education around this deadly disease, as well as the desire for increased screening," stated Matthew H.J. Kim, founder and CEO of Vigilant, in a press release. "Hundreds of thousands continue to be diagnosed with late-stage oral cancer every year, but we can reduce those numbers ... through early detection and a commitment to engage in conversations about risk factors." Only about a quarter (24%) recall talking to their dentist about oral cancer risks at their last checkup. About a third (34%) did not know that exposure to human papillomavirus (HPV) is a risk factor for oral cancer. Only 16% knew that 40% of people with oral cancer die within five years of diagnosis. "Regular screening and early detection are absolutely essential in the fight against oral cancer," John Comisi, DDS, Vigilant's chief dental officer, said in the release. "Any steps we can take to raise awareness about this issue and enhance screening practices will help us increase the survival rate for oral cancer."